A YouTube slip-up might just have revealed a new Google Chromebook called the Pixel. The original video that tipped this Chromebook has already been taken down (though more videos are, heroically, taking its place), but that won't stop the internet buzz about it. The video doesn't dish many details about the possible Pixel, likely named after its high-resolution display. What it does say is that it's a touchscreen laptop housing 4 million pixels on the display. According to guesswork around the net, that amounts to hearty a 2560 x 1700 resolution. The video originally comes from visual guide company Slinky.me, which claims the video got loose when the company's servers were attacked by hackers. But the video could very well have been a mistake public post. Whatever the reason, we got a nice rumor to chew on to be taken with a few grains of salt. Chromebooks are nothing new: there's the Acer C7 Chromebook and the Samsung Series 3 Chromebook, both released in the last few months. 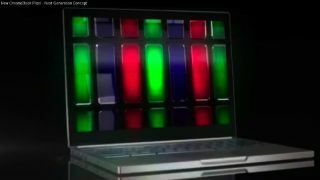 The video said this will be the first laptop completely designed by Google, which is somewhat true. Google attempted to release a Chromebook in 2010 called the Cr-48. But that notebook only made its way into a few hands and was never commercially available. There's no telling if the search engine will manufacturer the Pixel itself, or partner with another company to put it together, much like Google does with the Nexus brand of devices. The leak goes along with a rumor that made the rounds in November. It was from a suspect source, the China Times, which said Chinese manufacturer Compal was producing a Google-branded touchscreen notebook. But that rumor doesn't lend too much credence to this one. Whatever the case may be, we'll make sure to keep a close eye on any possible Chromebooks to come.